Now don’t forget, our challenges this term are based around movies and it will be an EITHER-OR-BOTH type of challenge. You can EITHER use the movie as inspiration OR use umbrellas as your theme. You may want to even kick it up a notch and use BOTH! We challenge YOU to come out and play with us!! 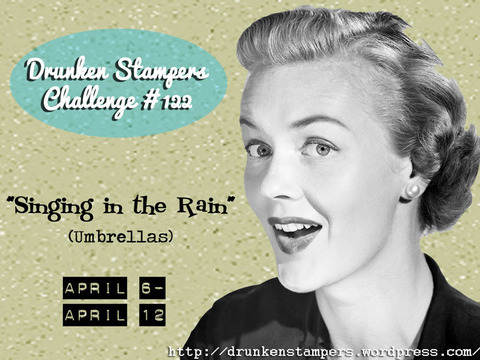 Be sure to visit the DRUNKEN STAMPERS BLOG for all the details on this challenge and to see what crafty awesomeness the Bahama Mamas have whipped up for us this week. I had so much fun making a mixed media canvas for the Design Team Throwdown Challenge that I decided to make another one for this week's challenge. It's amazing what you can do with canvas and paints from the dollar store!! I started the canvas by covering it in mod podge, sticking torn up thesaurus pages on the base then adding another layer of mod podge. Once that dried I painted it with a few different colours of blue and green, I tried to thin it out a bit so you could still see the word pages underneath. I spritzed it a few times with the water spritzer to get some rain spots. Next I heat embossed the birds on a wire and umbrella fella, stamped on some rain drops (not even sure if you can see them??) added the telephone pole, sun and grass, printed out the sentiment and voila...my second canvas. To play in this weeks challenge all you need to do is upload your project to the DRUNKEN STAMPERS BLOG using the InLinkz link. Please add the link DIRECTLY to your project blog post (any generic blog links will be deleted from the list). You have until Friday, April 12th at 11:59pm PST to post your link. Donna your canvas ROCKS! This would look great on my wall! Love the image you used, the colors, the techniques. Pure fabulousness! THis is fabulousness! The pages as foundation adds so much texture - love the bits showing through. The fringe, the embossing...it's just awesome. Awesome canvas, great stamp and sketch, love it.